Chance the Rapper always gives fans a lot to be thankful for. From absolutely nailing his Saturday Night Live hosting duties to appearing in some of the most hilarious skits the episode had to offer, Chance's edition of SNL was definitely one for the books. During Saturday night's episode (Nov. 18), the Chicago rapper declared himself as the "Mariah Carey of Thanksgiving," debuting a new song during his opening monologue. 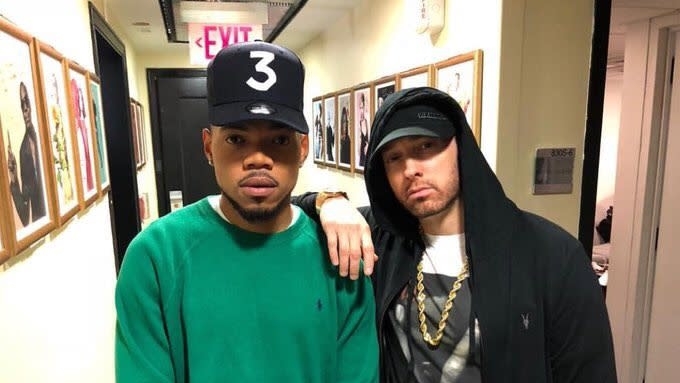 Rumor Report | Eminem & Beyoncé release new song "Walk on Water"
Following a slew of skits, including one where Chance plays homage to Barack Obama, it was time for Eminem's highly anticipated musical performance. While many were anticipating the legendary rapper to announce the release date of his forthcoming Revival album, or even surprise fans with an unexpected release, Em instead ran through his new collaboration with Beyoncé before going into a medley of some of his classics alongside Skylar Grey. Needless to say, from Em's performance to Chance as host and everything in between, fans had a lot to say about last night's episode. Take a look to see how Chance the Rapper and Eminem's SNL takeover went over with those tuning in at home in the tweets below.